A great small area game that promotes two things: offensive creativity and defensive zone coverage. In the diagram, the two teams are represented as Green and Blue. Coach designates which team is playing offense and defense in each section. Players have to stay within their section of the ice defined by the dashed red line. To start the game, the coach puts a puck in play on either side. It is a 3 on 3 game where players can score from anywhere. The defense is trying to get the puck to their forwards in the other section. However, the defense can shoot on the opposite net if the have the chance as long as they stay within their section. The game should be played in 30 -60 second intervals to keep up the intensity. A fun variation is to add a second puck. This demands greater awareness for the offense, defense, and goalies. 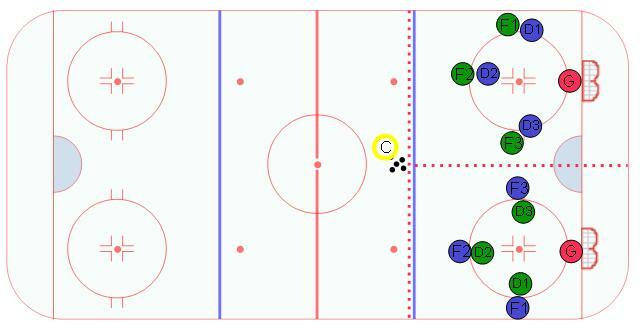 Forwards - work on moving to open ice to support your team. Defense - work on defensive zone coverage and do not over commit. Everyone - lots of communication, have fun and battle! Teammates of the other section should support their team by getting open for passes and looking to get rebounds off of a shot!